Acidosis is an increased acidity in the blood and other body tissue (i.e., an increased hydrogen ion concentration). If not further qualified, it usually refers to acidity of the blood plasma. Acidosis is said to occur when arterial pH falls below 7.35, while its counterpart (alkalosis) occurs at a pH over 7.45. Arterial blood gas analysis and other tests are required to separate the main causes. The term “acidemia” describes the state of low blood pH, while acidosis is used to describe the processes leading to these states. Nevertheless, the terms are sometimes used interchangeably. The distinction may be relevant where a patient has factors causing both acidosis and alkalosis, wherein the relative severity of both determines whether the result is a high or a low pH. The rate of cellular metabolic activity affects and, at the same time, is affected by the pH of the body fluids. In humans, the normal pH of arterial blood lies between 7.35 and 7.45. Blood pH values compatible with life in all mammals are limited to a pH range between 6.8 and 7.8. Changes in the pH of arterial blood (and therefore the extracellular fluid) outside this range result in irreversible cell damage. Metabolic acidosis may result from increased production of metabolic acids or disturbances in the ability to excrete acid via the kidneys. Renal acidosis is associated with an accumulation of urea and creatinine as well as metabolic acid residues of protein catabolism. A rise in lactate out of proportion to the level of pyruvate is termed “excess lactate,” and may be an indicator of fermentation due to anaerobic metabolism occurring in muscle cells, as seen during strenuous exercise. Once oxygenation is restored, the acidosis clears quickly. Another example of increased production of acids occurs in starvation and diabetic acidosis. It is due to the accumulation of ketoacids (ketosis) and reflects a severe shift from glycolysis to lipolysis for energy needs. The Henderson-Hasselbalch approximation is useful for calculating blood pH, because blood is a buffer solution. The amount of metabolic acid accumulating can also be quantitated by using buffer base deviation, a derivative estimate of the metabolic as opposed to the respiratory component. In hypovolemic shock for example, approximately 50% of the metabolic acid accumulation is lactic acid, which disappears as blood flow and oxygen debt are corrected. Treatment of uncompensated metabolic acidosis is focused upon correcting the underlying problem. When metabolic acidosis is severe and can no longer be compensated for adequately by the lungs, neutralizing the acidosis with infusions of bicarbonate may be required. Respiratory acidosis results from a build-up of CO2 in the blood (hypercapnia) due to hypoventilation. It is most often caused by pulmonary problems, although head injuries, drugs (especially anesthetics and sedatives), and brain tumors can cause this acidemia. Pneumothorax, emphysema, chronic bronchitis, asthma, severe pneumonia, and aspiration are among the most frequent causes. It can also occur as a compensatory response to chronic metabolic alkalosis. 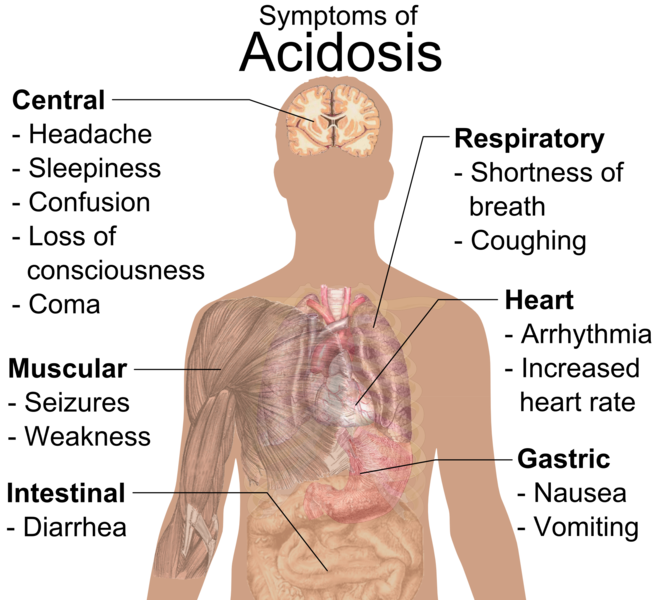 Symptoms of Acidosis: General symptoms of acidosis are described in relation to their location on the body. These symptoms usually accompany symptoms of another primary defect (respiratory or metabolic). Acidemia is the state of low blood pH; acidosis is the process leading to the state of acidemia. The normal pH of arterial blood is between 7.35 and 7.45. Metabolic acidosis may occur as a result of increased metabolic acids, either from increased production of metabolic acids, or decreased excretion of acids by the kidneys. The lungs compensate for metabolic acidosis by increasing the exhalation of CO2. Blood pH is calculated using the Henderson-Hasselbach equation, appropriate here because blood is a buffer solution. Respiratory acidosis occurs from an increased concentration of carbon dioxide in the blood, usually due to hypoventilation resulting from pulmonary problems. In respiratory acidosis, carbon dioxide concentration rises, but bicarbonate is normal or increased. Henderson-Hasselbalch equation: In chemistry, the Henderson–Hasselbalch equation describes the derivation of pH as a measure of acidity (using pKa, the negative log of the acid dissociation constant) in biological and chemical systems. The equation is also useful for estimating the pH of a buffer solution and finding the equilibrium pH in acid-base reactions (it is widely used to calculate the isoelectric point of proteins). respiratory acidosis: Respiratory acidosis is a medical condition in which decreased ventilation (hypoventilation) causes increased blood carbon dioxide concentration and decreased pH (a condition generally called acidosis). metabolic acidosis: In medicine, metabolic acidosis is a condition that occurs when the body produces too much acid or when the kidneys are not removing enough acid from the body.